Scientists in China hope to build a successor to the Large Hadron Collider—and take a new place on the international particle physics stage. The discovery of the Higgs boson was one of the biggest moments in the history of particle physics. It was also the discovery of one of the strangest particles ever revealed—an elementary, point-like particle with no spin, no electromagnetic charge and the ability to interact with itself. “In this situation, you just have to put this brand new weird particle under as powerful a microscope as you can,” says Nima Arkani-Hamed, a theoretical physicist at the Institute for Advanced Study in Princeton. Physicists in China are hoping to build that powerful microscope in the form of an electron-positron collider in a ring up to 100 kilometers long just outside Beijing. Arkani-Hamed is the first director of Beijing’s new Center for Future High Energy Physics, tasked with investigating the physics capabilities of such a machine and getting physicists around the world on board with the project. The Large Hadron Collider, where the Higgs was discovered, produces the particle in proton-proton collisions. Experiments at the LHC will continue to study the Higgs over the next decades. But scientists around the world—including the group in China—are also planning ahead for ways to get an even closer look at the bizarre particle. The hope is that creating a million Higgs will reveal tiny deviations from theoretical predictions about the particle’s nature, which would open up new paths to exploring science beyond the Standard Model of particle physics. The idea for a circular Higgs factory in China first came from Yifang Wang (pictured above), the director of the Institute of High Energy Physics in Beijing, who proposed it at a September 2012 meeting on the future of particle physics in China. IHEP has several successful particle physics experiments already, including the Daya Bay Neutrino Experiment, which studies neutrino oscillation. 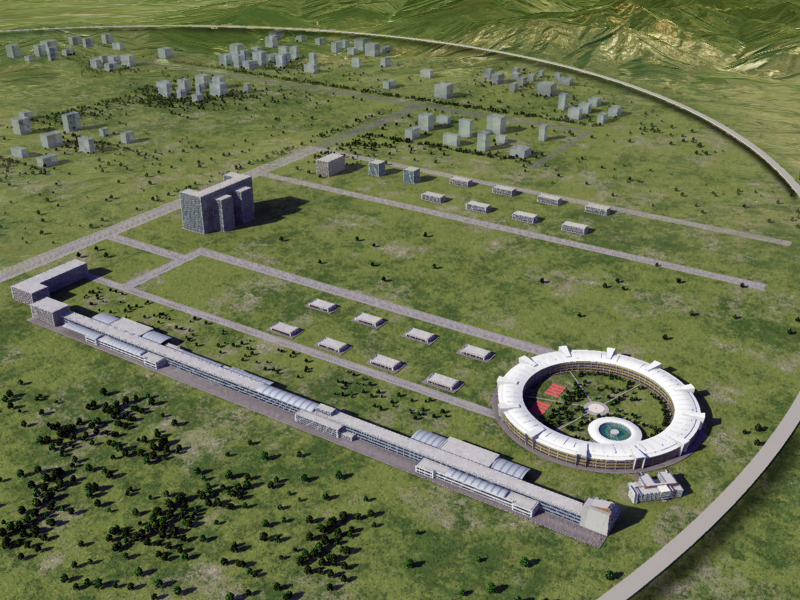 It’s also home to the Beijing Electron Positron Collider, a comparatively tiny 200-meter version of the giant collider Wang hopes to build in the next decade. In a proton-proton collider like the LHC, collisions that produce a Higgs also produce dozens of other particles, making it difficult to tease out which collision produced a Higgs. That’s because protons are made of quarks and gluons. But electron-positron collisions are much clearer, producing only a Higgs plus the well-known Z boson. That will allow physicists to study exotic decays. China is not alone in wanting to host a Higgs factory. The proposed International Linear Collider could be tuned to produce Higgs particles while exploring other new physics at higher energies. The idea of a circular Higgs factory actually first surfaced in 2011 as a possible reuse of the LHC tunnel at CERN. As part of the European long-range plan, CERN has established an international collaboration to develop a design for a Future Circular Collider in a new tunnel that would accelerate protons around the town of Geneva. The FCC could go through an intermediate phase as an electron-positron collider first. China’s government is set to award five-year funding to several national-scale projects by the end of this year, and Wang is hoping that a large investment in R&D to advance the case for the CEPC will be one of the winners. Winning the funding this year could allow construction to begin as early as 2020, with the first data starting to come in by the early 2030s. Now that a Higgs-like boson has been discovered at the Large Hadron Collider, proposals to build colliders that churn out the new particle are gathering momentum.